The Simpson’s Forest Hotel is a true destination for rest, relaxation and adventure with stunning views and quiet tranquility, surrounded by the best that nature has to offer in the surrounds of Meenawatte Estate. Time will here will not only give a blissful time away to rejuvenate, but an experience that will create memories to last a lifetime. Pleasing design aesthetics and modern conveniences will have guests feeling right at home and ensure an unforgettable stay. 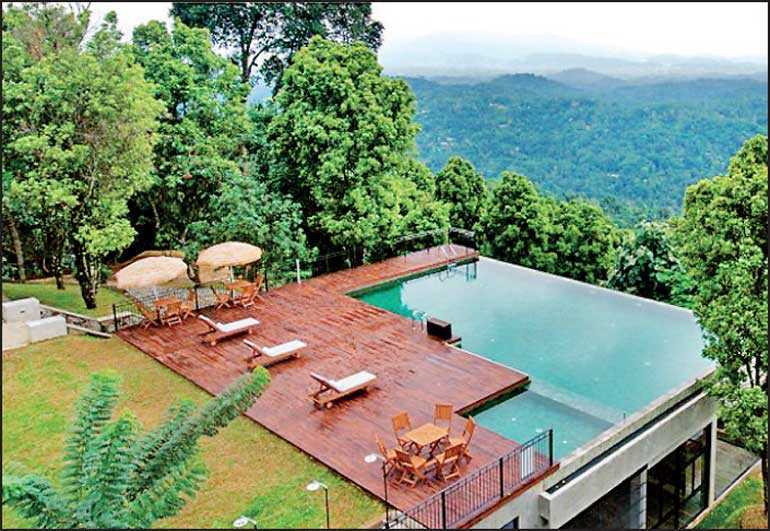 The 23 room luxury boutique hotel is in the quite surroundings of a Tea and spice plantation more than 80 acres in extent and gets its name from a former English planter who nurtured a forest patch (Simpson’s Forest) bordering the plantation. The colonial bungalow is located at the topmost point, adjacent to the infinity swimming pool with a stunning view of the Knuckles Mountain Range, and is an ideal gateway to cater to large groups of people. Among the many activities in which one can indulge are nature trail, wild river bath, bird watching, tea plucking activity and cooking with chef at Gamagedara. There is a gym and spa too and the hotel also boasts a helipad. The hotel is situated 13 km from Trinity Rugby Stadium (match venue) Pallekelle.